For over 75 years the GVKC has made its home in the Rochester, New York area. The GVKC is a member club of the American Kennel Club, and is comprised of individuals, who are interested in all breeds of purebred dogs. Meetings of the Genesee Valley Kennel Club are held the second Monday of each month (no meeting in August). Guests are always welcome! Usually, a program is scheduled for each meeting on a topic of interest from a variety of dog-related subjects. Programs may include speakers, films or demonstrations. The programs cover just about everything of interest to dog enthusiasts. At our meetings, we are also informed of and discuss proposals and changes sponsored by the American Kennel Club. A refreshment time is usually held, and provides a great way to meet other "dog people" experienced in showing and breeding. GVKC members are always willing to share their interest and expertise in dogs, and welcome fellow enthusiasts. The GVKC is an active organization. The GVKC holds two AKC All-Breed Dog Shows and Obedience Trials in July of each year, and an annual sanctioned Match Show. The GVKC also holds health clinics, publishes a Breeders Guide, and provides an informational phone line. We have a variety of committees all working towards dog-related activities. 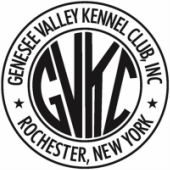 For specific information about meeting dates, times, programs, location, and activities of the club, or for help with dog related questions or problems, call the GVKC Phone Line at (585) 249-9204 or contact a club officer or board member (listed on the other tabs).